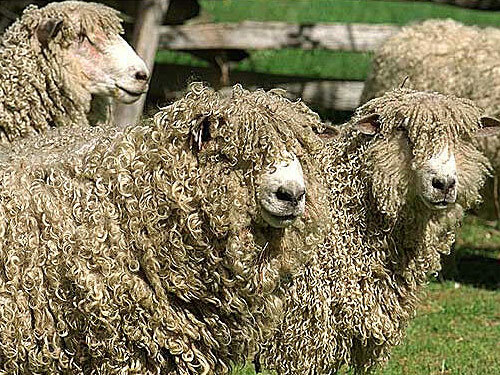 Leicester Longwool Sheep are perhaps the most historically significant of all sheep breeds in its British homeland, and it is certainly the most famous of the longwools. It was the breed selected for development by Robert Bakewell, the most renowned and successful of all the early workers in the field of livestock improvement. Working at Dishley Grange in Leicestershire from 1755, he produced the New - or Dishley - Leicester, which combined the breeds original hardiness and excellence in the production of a long, heavy fleece with an increase in fattening ability and early maturation. Unfortunately Bakewell did not record his breeding and development methods - nor talk of them much - although there is no doubt he was hugely successful. The Leicester was brought to New Zealand in 1843 - where it was promptly renamed the English Leicester - to be farmed on the lower, wetter areas unsuitable for the Merino. They were used in the creation of several breeds developed in New Zealand, notably the Corriedale and the Halfbred. Leicester rams are still in some demand today to create this latter breed, although their numbers are substantially reduced. Content and Photo Source: New Zealand Rare Breeds (www.rarebreeds.co.nz).